If you still haven't been won over by the complete awesomeness of virtual reality and the Oculus Rift, this video might just change your mind. By kitting out a helmet with an Oculus Rift DK2 and sticking it on the head of professional Formula Drift driver Matt Powers, motor oil company Castrol Edge has come up with a rather awesome looking stunt for its Titanium Trial driving challenge. The video, which you can watch below, combines both real life and virtual reality - as Powers drives his Roush Stage 3 Mustang on a track, but only sees a crumbling, futuristic world fall apart around him through the Oculus Rift headset. 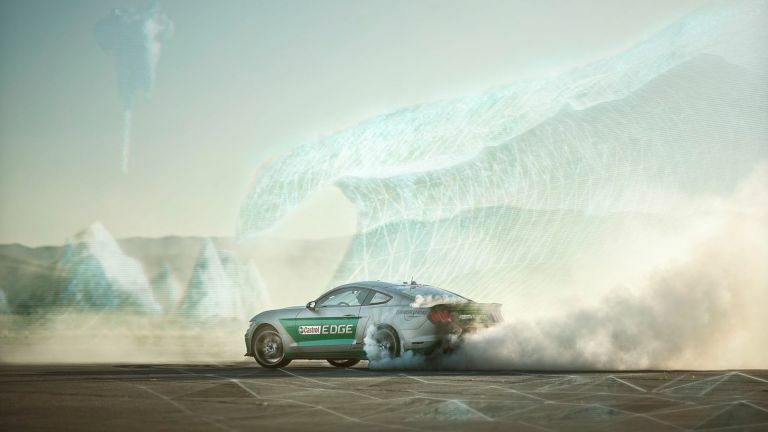 To create this, Castrol's 'creative technologists' turned the vehicle into a game controller using data gathered from the car's internal diagnostics and exterior positional tracking systems. Every movement made by the car, including steering angle and throttle spin, was tracked and synced up with the headset so Powers could experience the virtual world in real time. It's sort of like the most bonkers racing video game we've ever seen. Though we're not expecting to anything quite as ambitious as this to play on our PCwhen we finally see the first public release of the Oculus Rift early next year, but then that's because most devs don't have the financial muscle of a global automotive lubricants marque behind them. Now if you'll excuse us, we're off to buy some oil.